There are numerous weeds that are dangerous mainly due to being poisonous, but there are two introduced weeds that their removal from the countryside is essential. 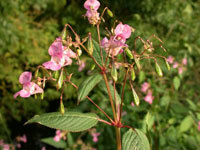 Himalayan Balsam (Impatiens glandulifera) is an annual from the Himalayas, that can reach over 2 meters in a season and readily produces a mass of large pink, helmet shaped flowers. It can flick its seed (over 800 seeds a plant) at least 1.5m and is so prolific that it smothers out other plant taking all their light and nutrients.. It also is very rich in nectar that is much loved by bees, especially bumble bees, that then do not bother to visit other species, thereby reducing their pollination and reproduction by seed. Hedgehogs are a well-known nocturnal mammal, often only seen in the daytime as a squashed specimen on a road. They are very spiny, the spines normally lying flat to the body and pointing backwards, but when alarmed they are raised and point in all directions, usually as they roll into a ball. Unfortunately this does not protect them from a hungry badger, which is why one will not find many hedgehogs in areas of high badger populations. For this reason we should all help hedgehogs to survive, not by eliminating badgers but by providing suitable, habitats, homes and food for hedgehogs.. They like to forage in dense vegetation at the bottom of hedgerows or woodland copse, although they can be happy in a thickly planted flower garden. They will rest or hibernate in fallen leaves, compost heaps and potential bonfires, so be careful when digging in these areas or lighting the bonfire. They will use an artificial home - a wooden box 300mm square with an entrance on one side 100mm x 150mm. Do not use treated timber and do not paint it. Drill a few holes in the side for ventilation and tuck it into the bottom of a hedge, nice and peaceful, out of the sun and where rain cannot enter. They love to munch beetles, worms, caterpillars, spiders, slugs, snails and carrion. So putting out a bowl with meaty (not fish) dog or cat food, minced meat, crushed cat biscuits or chopped boiled eggs at dusk can encourage them, but remember to remove it in the morning. Put out shallow bowls of fresh water, not milk and bread as this can cause diarrhoea problems. If you find that you have one visiting you do not attempt to enclose them in your garden as they are known to travel up to 3 kilometres at night sniffing out food, which rarely includes fruit. Most importantly if you have a garden pond then make certain you have a slope that they can use to climb out should they fall in. Dot and I have just (Wed 25th July 2017) visited a garden in Rattery to help identify an orchid growing in a crack in the paving right in front of a woodpile store. 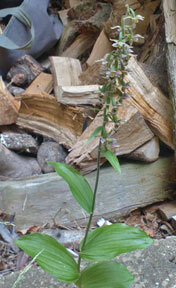 It turned out to be a Broad-leaved Helleborine (Epipactis helleborine). It is the first time we have seen one growing in the UK although we have been fortunate to have found it a number of times on our European botanical trips. It grows to a height of 75cm with dull green leaves, relatively broad and strongly veined. 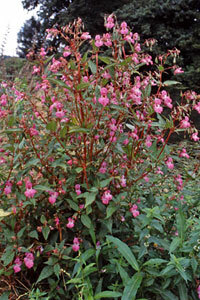 The flowers are arranged in a long, slightly drooping raceme and dull green with hints of purple. The big question is how did it get there? Well, the seed of orchids are exceptionally fine with millions produced from one plant. They are easily carried on the wind over considerable distances. It is generally recognised that terrestrial orchids need to grow in association with particular fungi, so it is very rare occasion when the two meet. This particular orchid requires a cool, moist, lightly shaded spot, and hates fertiliser. Orchid seed also has a very short life, readily losing its viability. 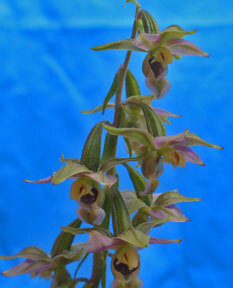 It is widespread across Europe to China, and is classified as a ‘weedy orchid’ in parts of North America. It has also been found in the centre of Moscow. The recently published A New Flora of Devon Flora by the Devonshire Society, says that it is frequent, usually single or small groups in woodland, hedge banks and among scrub on slightly acid to calcareous soils. A friend has seen them in Northwood, Dartington and Hembury woods. We obviously have been in the wrong place at the wrong time, or just not looking in the right direction. A medium sized orange brown butterfly now (late July) fluttering around hedgerows, particularly near the base, and not too far from violets is almost certainly a Pearl-bordered Fritillary. It is the Small Pearl-bordered Fritillary that is usually around now, the slightly larger Pearl-bordered Fritillary is usually the first fritillary to be seen each year from April to June, It can have a second showing from a second brood in August. Both specie go around seeking out violet plants, tasting the leaves through their feet. When suitable plants (marsh or dog violet) are found they tend to lay their eggs or drop them haphazardly in the area. Eggs hatch within 10 days and the caterpillars are able to smell violet foliage and not necessarily while in flower. The April to June brood feed until September when they hibernate, although some are known to have matured early, carried out metamorphosis, mate and egg lay. Usually the small caterpillars hibernate from September until the early Spring, when they seek out violet leaves and gorge themselves for about a month before changing to a chrysalis and then an adult butterfly. Exact details of their behavior differ in publications with one saying that eggs are laid on rough bark, which would explain why, when, a couple of years ago, taking a close up photograph of a butterfly, it flew onto my beard and laid an egg. I duly trimmed my beard and carefully pressed hair and egg into a crevice low down on a hazel plant where I knew violets grew nearby. A wild flower meadow in one’s garden can not only be a thing of beauty, but also interesting for the wild life it attracts, ; a very import feature for Nature Conservation. However this time of the year (Late June/early July) is not the time to commence making one or carrying out any maintenance therefor there will be more on this subject in 6-8 weeks time. What can be done from now until the autumn is to collect seed from wild plants, and storing them in paper bags or envelopes (not polythene or jars or tins), in a cool, dry, preferably dark place. A very useful, almost essential plant is Yellow Rattle, (Rhinanthus sp) which is semi-parasitic on grass. To know what it looks like search ‘Rhinanthus’ on the Internet. I have a lot of plants of it seeding in my wildflower meadow, so if seed is wanted, then contact Dot or myself and arrange to collect some. Potential lawn sites can be helped to be of low fertility by regularly mowing close and removing all the clippings. In the mean-time start collecting a little amount of seed, not plants, of numerous wild flowers. Who is eating my lilies? Having watched your lily bulbs sprout nd then grow to produce strong stems with a cluster of buds at the top suddenly losing many leaves and even having the flowers eaten away? Well the culprit could be a ‘steeple jack’ strain of snail or slug working at night, but more likely the Lily Beetle. The adult is bright red and up to 8mm long, its larvae hump-back, reddish yellow and covered in black slime. It is widely distributed in Europe , but is now spreading across South and western England, and reports of infestations in Scotland.. Both the adult and larvae are voracious eaters, but the adult is sneaky, as it tends to hide away under leaves and in the axils of leaves, often quickly dropping to the ground when disturbed. This makes control more difficult, as the best alternative to regular insecticidal sprays is ‘fmger and thumb’ control - carefully searching over your lilies, squashing the insects, which must be done thoroughly as the adult beetle has a hard coat and its larvae is slippery because of the black slime. Problems can commence as early as April when the first adults appear, having hibernated in the soil. A female lays200-300 eggs which hatch after 10 days so infestations can be huge. Not content with eating our lilies the beetle has added fritillaries, Nomocharis and Solomons Seal to its diet. If you suspect the culprits are snails or slugs then a search at night withe a torch might catch them at work. Ratty in Kenneth Grahame’s children’s novel, Wind in the Willows, shows a restless side to his character, which fits the behaviour of the wild mammal, the mole. Active all year, and can be a bane to gardeners, with their runs and soil mounds. Having cut down my early wildflower meadow I have exposed numerous mounds. While not a rule of thumb, I can usually reckon to see mounds appearing around 4.0pm. Small mounds in a line usually indicate the progress of deep tunnels, larger mounds may cover a nest and are more likely to occur in the Spring as mating occurs during February and March, while shallow runs, sometimes breaking the surface and prone to collapse are usually feeding tunnels. Fertile, well draining loams are preferred, the moles making regular forays, collecting worms and at times biting the ends off and storing them in a larder. Gardeners have been known to collect mole hills, the soil being used for potting. However, having ones lawn spoilt by mounds and runs usually demands urgent action. Some people are adamant that talking to them and asking them to go away works. I suspect the vibrations of regular presence annoys them, which is why electronic vibrators in the ground sometimes works. 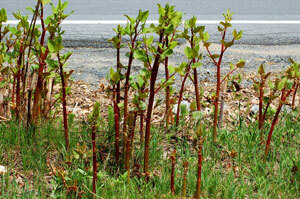 As they are haemophiliacs sharp leaves and twigs in their runs may result in them bleeding to death. Spring traps work but there is an art in setting them, which is why many years ago being a molecatcher was a reasonable livelihood. Stabbing areas where they are thought to be with a garden fork may work. Smoke bombs have a limited effect as their runs are extensive and the smoke rarely reaches all their tunnels. On the other hand stamp down their runs, and mounds, then smooth things over and hope that they get tired of your plot and move next door. 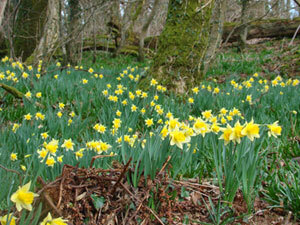 In a small light woodland area adjoining Knowle Farm, Rattery is an steadily increasing colony of a rare form of the British wild daffodil, Narcissus pseudo-narcissus known as the Rattery Daffodil. It looks like a normal Narcissus pseudo-narcissus in shape, size and colour, except on closer examination the trumpet is full of petaloid segments. The area was fenced and the late Harry Jonas, a keen conservationist and nature lover, allowed his bullocks in for a time each year. The bullocks while controlling the vegetation disturbed the bulbs which became scattered. It is possible that only one bulb became doubled and it has been the bullocks over the years that have divided and spread the Rattery form, which now occurs in the neighbouring field of Knowle Farm. 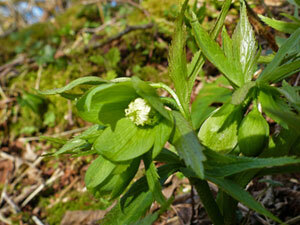 In my copy of the Flora of Devon, published in1939 and edited by Rev Keble Martin, there are references to the somewhat rare Green hellebore, Helleborus viridis var occidentalis. While first recorded in an orchard near Islington in 1820 it was recorded in 1939 occurring in a number of Devon parishes. We are fortunate to have a small colony thriving in a shady bank close to the river Harborne in Knowle Farm. As the name indicates the flowers are pure green. It occurs very locally in England and Wales as far north as Yorks and Lancs in woodland areas on calcareous (lime) soils and it is still regarded as relatively rare.